One of the most important parts of any digital marketing strategy is earning SEO backlinks. That’s because Google’s top priority is to deliver high-quality information to their users. 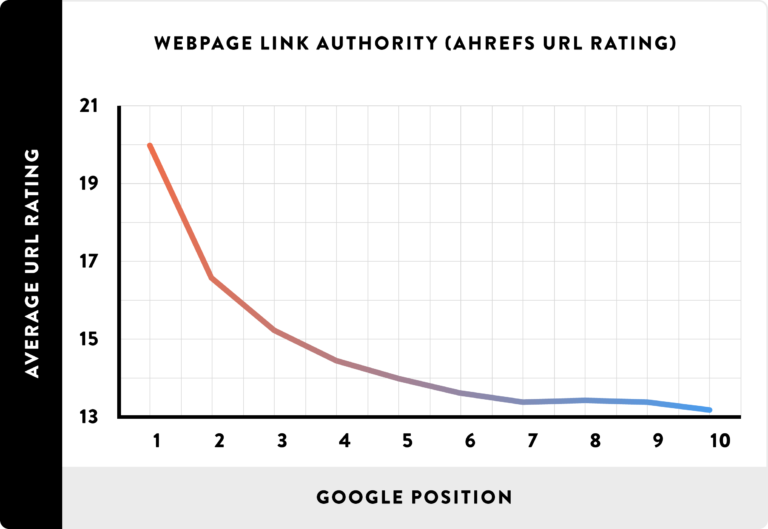 So when they rank results, each site’s level of authority plays a major role. But earning that authority isn’t as simple as optimizing a title tag or publishing a blog post. In fact, the factors Google uses to determine how trustworthy a site is don’t even occur on that site. Instead, its algorithm relies heavily on links from other sites. And when you think about it, this makes sense. After all, if a lot of reputable sites are willing to link to you as a source of information, or direct their readers to one of your pages, this is a strong indicator that your site provides something of value. After all, If you leave it up to other site owners to find your content and link to it, it could take years to accumulate enough links to show Google that your site is trustworthy. So to build your authority (and improve your rankings), you need to take a proactive approach. And that means creating a link building strategy. That’s why on this page, we’ll cover what backlinks are, why they’re so important, the difference between “nofollow” and “dofollow” links, and six ways you can earn valuable backlinks for your site. Before we jump into the strategies you can use to earn backlinks, it’s important to understand what, exactly, they are. Fortunately, the explanation isn’t a complicated one. Whenever another site links to one of your pages, that’s a backlink. These are also often referred to simply as links. Your backlink profile, then, is a compilation of all of the links pointing to your site, and it’s how Google measures authority. Each link from a trustworthy website strengthens your backlink profile. It also increases your domain authority. Domain authority is a numerical value on a scale from one to 100 that indicates how trustworthy your site is, according to its backlink profile. So the more links you earn from reputable sites, the more this number will increase. And the higher this number, the easier it will be for your pages to rank well in search results. 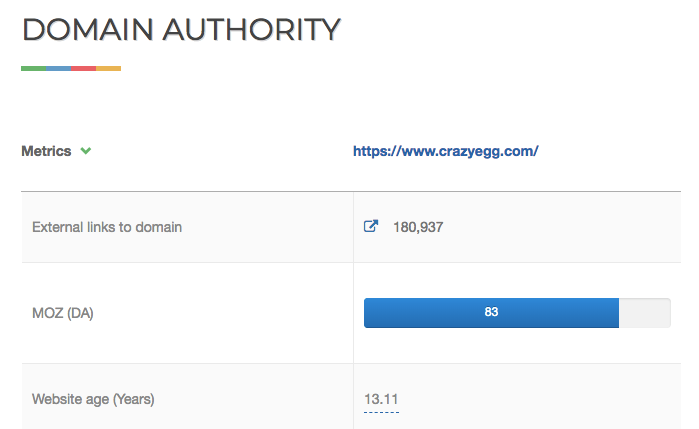 You can keep an eye on your site’s domain authority by using Website Authority Checker. Just enter your domain and click “Perform Check,” and you’ll see a DA number between one and 100. To be clear, we don’t know how exactly Google calculates domain authority — and this number is not pulled directly from them. But it can still provide a fairly accurate look at how your site stacks up in terms of links. So as you improve your backlink profile, monitoring this number can give you an idea of how well your efforts are working. 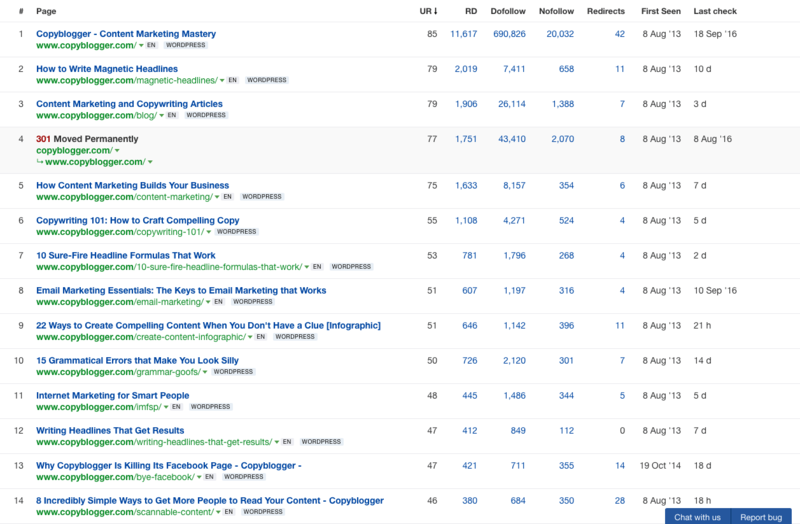 Plus, you can also check on your competitors’ authority and see how you stack up — so that as you build new links, you have concrete benchmarks to work towards. So, backlinks are how Google measures authority. But you might be wondering how important they really are to your strategy. After all, optimizing your on-page elements alone requires a significant amount of time and work. Is it really necessary to spend time convincing other site owners to link to you, too? The answer is absolutely yes. A strong backlink profile is essential to SEO. It would be impossible to achieve the rankings you want without links from trustworthy websites. And you don’t have to take my word for it, either — multiple studies have confirmed that pages with the highest total number of links tend to rank highest in Google’s search results. That’s a correlation that’s hard to ignore. Plus, according to another study, pages ranking in the second spot for high-volume keywords have an average of 10,000 more referring domains than those ranking in the tenth position. And when it comes to the top spot, links can make all the difference. Pages ranking in the first position have an average of 2.2 times more backlinks than those ranking in the second. So as you optimize your site for search, remember that links are an essential part of the process. They can be what moves your site from obscurity to a top spot — so they’re entirely worth the effort to build. As you earn links for your site, it’s important to be aware of two different types of links: do follow and no follow. The entire point of earning links for your site is to boost your credibility in Google’s eyes. Unfortunately, not all links will help you accomplish this goal. This indicates that the link will not pass value to the target domain, and as a result, won’t help that site rank higher in search results. So as you evaluate link targets, it’s worth your time to determine whether each one links to outside sources with normal, “do follow” links. Sites that use nofollow as standard practice can still be a valuable source of referral traffic, but earning links from them won’t have a direct impact on your site’s authority — and that’s an important factor to consider when deciding which sites to reach out to. Why Does Link Quality Matter? Much like many parts of an SEO strategy today, succeeding with link building requires focusing on quality over quantity. And that’s a major change from the early days of SEO. When site owners first realized that Google’s algorithm used links from other sites to determine their authority and that more links meant higher rankings, many of them worked towards earning as many links as possible from wherever they could. Practices like low-quality directory submissions, spam blog commenting, and paying other site owners for links were all effective for boosting rankings. Google’s goal from the beginning has been to provide its users with the best possible results for their searches — and spammy links are not indicators of quality. As a result, they’ve made numerous algorithm updates over the years with the goal of devaluing spammy, low-quality links. That’s why today, the practices I mentioned above won’t work. And it’s not just that they won’t boost your rankings, either — if Google picks up on spammy links building practices, they may choose to issue a manual penalty that will prevent your site from appearing in search results at all. Considering that this is the exact opposite of what you’re trying to do with your SEO strategy, earning low-quality links simply isn’t worth your time. Instead, you’ll want to work towards fairly earning links from high-quality, reputable sites. This is not only the best way to avoid a penalty from Google, but it’s also a more effective way to boost your rankings. That’s because today, links from high-quality URLs correlate with strong page one rankings in Google’s results. So as you look for opportunities to build links, remember that quality is much more important than quantity — and that a handful of links from reputable sites will have a more positive impact than dozens from spammy sources. Earning backlinks can be challenging. After all, you’re essentially asking another site to vouch for your quality and trustworthiness. This means that to get another site to link to you, you need to provide something of value. And there’s plenty of room for creativity in the exact ways you go about doing this. But if you’re new to link building, you’re likely looking for more concrete direction on what you should be doing. And if that’s the case, the following six methods are tried-and-true ways to earn high-quality links that will help you boost your authority and improve your SEO. Guest posting is one of the oldest strategies for earning links, but it’s stuck around for one simple reason: it works. If you’re unfamiliar with this strategy, it involves reaching out to other blogs and site owners and offering to contribute content for free. Then, if a site owner accepts your offer, you can include a link to your site within the body of the content you contribute, or within your byline. For example, when Search Engine Journal publishes guest contributions, the author gets a brief bio at the end of the post. In most cases, the author’s job title links to their company’s website. This is one of the best ways to earn links from reputable sites within your industry, but as you may have guessed, it can be work intensive. After all, this strategy has been around for long enough that editors know exactly what a writer is doing when they reach out and offer content at no cost. And while many of them are still happy to include a link in exchange for content, that’s only true if the content is high in quality. So if you want to use this strategy, you’ll need to put in the time it takes to come up with ideas that are relevant to your target site’s audience, then create content that’s worth a link. But first, you’ll need to identify sites that you pitch your contributions to. In some cases, your targets will be obvious. If you know of any publications within your industry, these are a great starting point. You might also consider pitching traditional editorial sites in your area if you’re a local business. But beyond that, you may need to do a bit of digging. And one of the best ways to uncover opportunities is with competitor research. This process involves identifying sites on which your competitors have been published — with the logic that if a site has linked to a competitor, they’ll link to you, too. 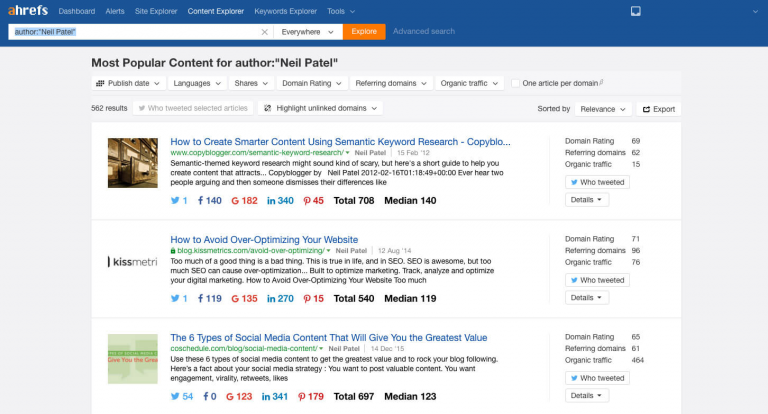 You can find these sites by using Ahrefs’s Content Explorer. Use the “author” operator to search for well-known figures within your industry. Then, Ahrefs will show you all of the sites on which that person has been published, as well as the site’s domain authority and traffic levels. You can use this insight to determine which sites might present opportunities for guest posts, then prioritize based on their potential to boost your authority. Writing entirely original articles isn’t the only way to get your company’s name into major publications. You can also take a more traditional, PR-style approach by looking for opportunities to get your company included in news coverage. 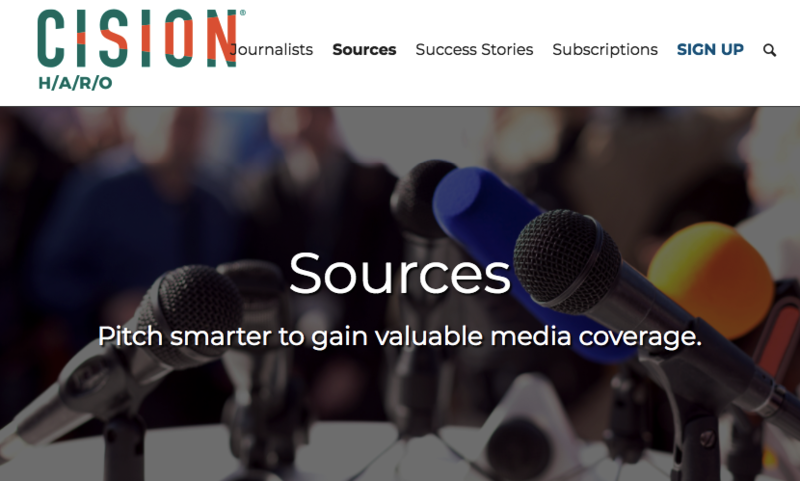 One of the best ways to do this is to sign up to be a source for journalists through sites like Help A Reporter, or HARO. This service is designed to help writers find qualified sources of quotes and research for the articles they’re writing. When you sign up as a source, you can indicate your areas of expertise — with the obvious choice being your company’s industry. Then, you’ll start receiving daily emails with lists of specific needs from journalists. If you’re qualified to answer any of their questions or provide a quote, you can reach out and tell the journalist more about your qualifications. If they’re interested in what you have to say, they can contact you for more information, then include you in the final article — with a link to your company’s site as the source. Many sites have thousands of links out to other sites as sources for statistics, facts, and other information. But when sources move or delete the pages they link to, those links break — which is bad for user experience. You can use this to your advantage by finding broken links to content related to your industry, then providing a page on your site as an alternative. First, use Ahrefs’ Broken Link Checker to find backlinks that aren’t working. Enter the domain of a site you want a link from, then take a look at the Broken Links report. Here, you’ll see all of the links on that site that link to pages that no longer exist. Take a look at the context of these links, and see if there are any resources that your site already provides. If there are, reach out to the site owner and let them know that their page contains a broken link — and that you have a solution. If you’re unfamiliar with the term “skyscraping,” it refers to the process of finding content in your industry that’s already extremely successful, then producing something even better. 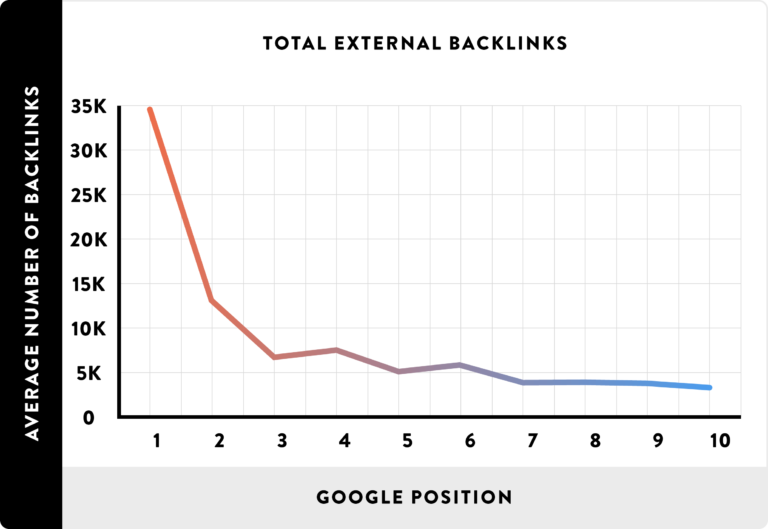 This technique was coined by Brian Dean of Backlinko — and in one study, after executing it on an already-popular post, he was able to dramatically improve the page’s backlink profile. You can identify opportunities for skyscraping by using Ahrefs’ Site Explorer. Enter a domain — like one of your competitors’ — and select Site Explorer > Pages > Best by Links. This report will show the most linked-to pages on the entire domain. Scroll through this report, and see if there are any topics that are particularly relevant to your industry or within your area of expertise. If so, take a look at the page on your competitor’s site, and look for ways in which you could produce something even better. This way, you can create a new piece of content around a topic that you know others in your industry are already interested in and willing to link to — so that when it comes time to pitch your content, you already know exactly who your targets are. While many of the strategies on this page center on creating new content then pitching it as a resource, the resources you create don’t always have to be entirely original. Now, to be clear, this doesn’t mean you should plagiarize other sites’ content. Ever. But you can compile other research from multiple sites to create a comprehensive resource for sites within your industry. For example, just consider Content Marketing Institute’s B2B Content Marketing report. The site produces a new report each year, and much of it is simply a compilation of new statistics from the past year. So while the research is not all original, it’s put together in a way that’s convenient for writers looking for concrete data about the content marketing industry. 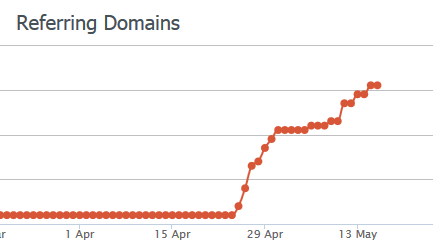 Now, let’s take a look at the report’s backlink profile in Ahrefs. That’s 1,516 unique domains linking to that one piece of content. So if you’re able to able to create a helpful resource for others in your industry, the payoff can be significant. This is especially true if compilations of facts and statistics are currently hard to come by — so if that’s the case for your industry, this could be a fantastic opportunity to earn valuable links from blogs and other publications. Another great way to identify link targets for your site is by doing some competitor research to see which sites are already linking to your competitors. 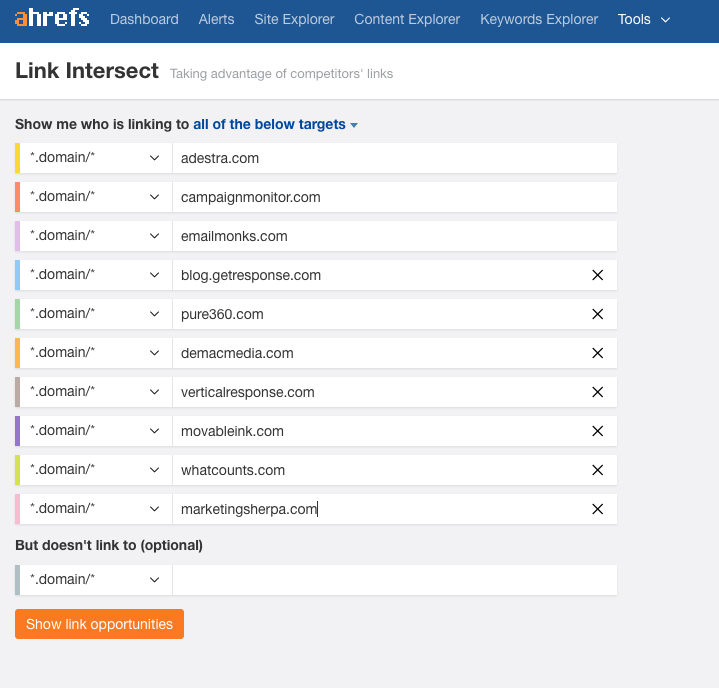 You can start by using Ahrefs’ Link Intersect tool to find sites that are linking to multiple competitor sites. Enter a few of your competitors’ domains, and you’ll see a list of sites that link to all of them. Any sites that appear in this list are prime link targets for your site. And if you’re unsure of which competitors to search for in this tool, you can start by searching for one of your target keywords. See which sites are ranking in the top ten, then drop each of those URLs into this tool. After all, these are the sites that are outranking you for some of your most important terms — so if there are sites linking to them, and not to you, it’s in your best interest to try to earn links from those same sites. In some cases, other site owners will find the resources on your site naturally, then cite them in their articles in posts. But it’s best to take a more proactive approach — and that requires outreach emails. These are emails you send to editors and owners of the sites you want links from, with a brief pitch explaining your offer. And you’ll need to be careful with how you write these emails. Today, many site owners are inundated with cold email pitches on a daily basis. So unless your pitch really stands out, it’s likely to end up in their trash folder. To avoid this fate, keep your pitch emails brief, personalize them to your recipient, and never ask for a link without providing something of value in return. For example, just take a look at the following sample pitch email from GMass. In this case, the writer compliments the site’s existing content and points out an issue — presumably because they want to provide a page on their own site as an alternative to one of the broken links. Instead of simply asking for a link, they put in the time to identify an issue that they have the power to solve. This positions them as a helpful resource, instead of another site begging for a link. As with many parts of SEO, there’s a “white hat” and a “black hat” way to build links. And some of the black hat methods to avoid are obvious. 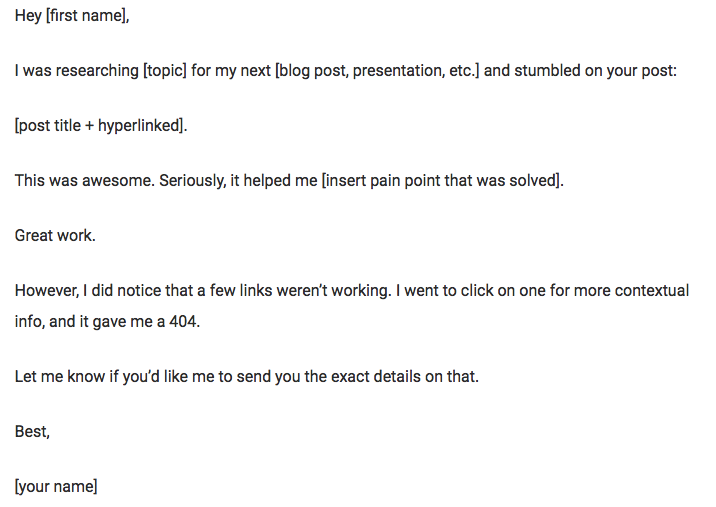 You should never pay for links, post spam blog comments, or submit your site to “thin” link directories. These are all virtually guaranteed to land you a Google penalty and have the exact opposite impact you’re hoping to make on your rankings. But it’s also important to make sure that you’re not spamming your potential link targets. Sending annoying, repetitive emails to the owners and editors of the sites you want links from is highly unlikely to get you anywhere. In fact, sending the same pitch over and over is a surefire way to have our recipients mark you as spam — and prevent you from reaching them (and other site owners) in the future. This means it’s essential to keep track of your outreach efforts. 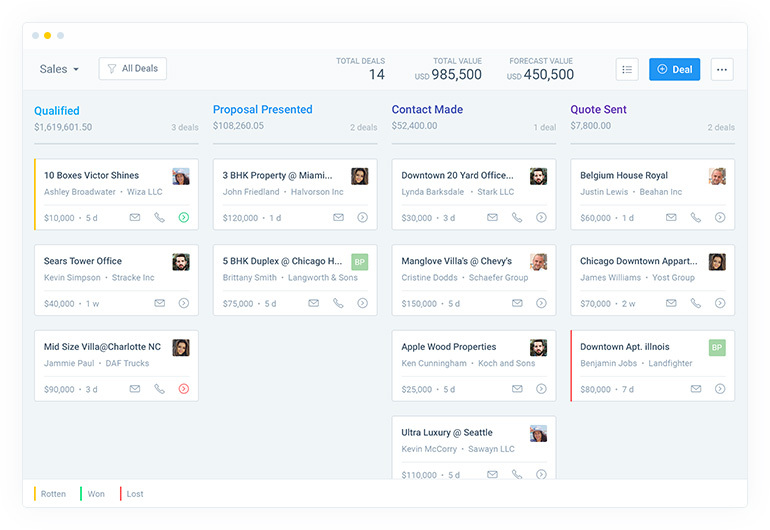 And while that can be a challenging task if you’re running a large-scale link building campaign, you can use a tool like Salesmate to sync all of your documents. Keep track of your link targets, the pitch templates you use, and each email you send — including any followup emails. This way, you can be sure that you’re not spamming the sites you want links from — and earning a reputation as a spammy, black hat link builder. Earning backlinks for SEO is one of the more challenging parts of search engine optimization — but it’s also one of the most important. Your off-page SEO can make or break your ability to rank in Google’s search results, so it’s more than worth your time to try to earn links from reputable, trustworthy sites. Fortunately, there are several ways to accomplish this goal. 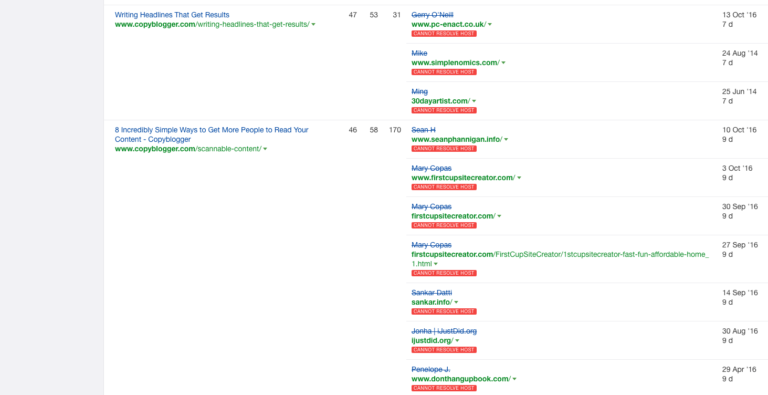 Guest posts, public relations, broken link building, skyscraper content, and competitor research are all excellent ways to earn links from reputable sites. And if you combine each of these approaches (and exercise some patience), you’ll be able to establish a well-rounded backlink profile. How do you get backlinks for your site?